C program to copy files: This program copies a file, firstly you will specify the file to copy and then you will enter the name of target file, You will have to mention the extension of file also. We will open the file that we wish to copy in read mode and target file in write mode. C program to read a file: This program reads a file entered by the user and displays its contents on the screen, fopen function is used to open a file it returns a pointer to structure FILE. FILE is a predefined structure in stdio.h . If the file is successfully opened then fopen returns a pointer to file and if it is unable to open a file then it returns NULL. fgetc function returns a character which is read from the file and fclose function closes the file. Opening a file means we bring file from disk to ram to perform operations on it. The file must be present in the directory in which the executable file of this code sis present. There are blank lines present at end of file. In our program we have opened only one file but you can open multiple files in a single program and in different modes as desired. File handling is very important when we wish to store data permanently on a storage device. All variables and data of program is lost when program exits so if that data is required later we need to use files. Anagram in c: c program to check whether two strings are anagrams or not, string is assumed to consist of alphabets only. Two words are said to be anagrams of each other if the letters from one word can be rearranged to form the other word. From the above definition it is clear that two strings are anagrams if all characters in both strings occur same number of times. For example "abc" and "cab" are anagram strings, here every character 'a', 'b' and 'c' occur only one time in both strings. Our algorithm tries to find how many times characters appear in the strings and then comparing their corresponding counts. This program computes frequency of characters in a string i.e. which character is present how many times in a string. For example in the string "code" each of the character 'c', 'o', 'd', and 'e' has occurred one time. Only lower case alphabets are considered, other characters (uppercase and special characters) are ignored. You can easily modify this program to handle uppercase and special symbols. Explanation of "count[string[c]-'a']++", suppose input string begins with 'a' so c is 0 initially and string = 'a' and string-'a' = 0 and we increment count i.e. 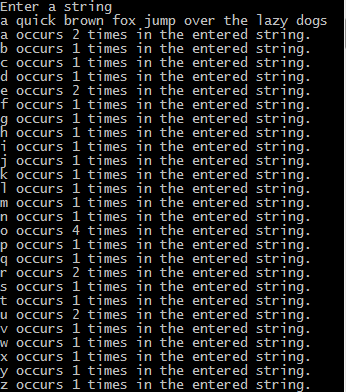 a has occurred one time and repeat this till complete string is scanned. C program to convert decimal to binary: c language code to convert an integer from decimal number system(base-10) to binary number system(base-2). Size of integer is assumed to be 32 bits. We use bitwise operators to perform the desired task. We right shift the original number by 31, 30, 29, ..., 1, 0 bits using a loop and bitwise AND the number obtained with 1(one), if the result is 1 then that bit is 1 otherwise it is 0(zero). Above code only prints binary of integer, but we may wish to perform operations on binary so in the code below we are storing the binary in a string. We create a function which returns a pointer to string which is the binary of the number passed as argument to the function. C keeps a small set of keywords for its own use. These keywords cannot be used as identifiers in the program — a common restriction with modern languages. Where users of Old C may be surprised is in the introduction of some new keywords; if those names were used as identifiers in previous programs, then the programs will have to be changed. It will be easy to spot, because it will provoke your compiler into telling you about invalid names for things. Here is the list of keywords used in Standard C; you will notice that none of them use upper-case letters. The new keywords that are likely to surprise old programmers are: const, signed, void and volatile (although void has been around for a while). Eagle eyed readers may have noticed that some implementations of C used to use the keywords entry, asm, and fortran. These are not part of the Standard, and few will mourn them. C Pointer is used to allocate memory dynamically i.e. at run time. C Pointer is a variable that stores the address of another variable. The variable might be any of the data type such as int, float, char, double, short etc. Where, * is used to denote that “p” is pointer variable and not a normal variable. Normal variable stores the value whereas pointer variable stores the address of the variable. The content of the C pointer always be a whole number i.e. address. Always C pointer is initialized to null, i.e. int *p = null. The value of null pointer is 0. & symbol is used to get the address of the variable. * symbol is used to get the value of the variable that a pointer is pointing to. If pointer is assigned to NULL, it means it is pointing to nothing. Two pointers can be subtracted to know how many elements are available between these two pointers. But, Pointer addition, multiplication, division are not allowed. The size of any pointer is 2 byte (for 16 bit compiler). Call by value This method copies the actual value of an argument into the formal parameter of the function. In this case, changes made to the parameter inside the function have no effect on the argument. Call by reference This method copies the address of an argument into the formal parameter. Inside the function, the address is used to access the actual argument used in the call. This means that changes made to the parameter affect the argument.